At present we have very little information on the guns used last week by Saïd and Chérif Kouachi to commit a massacre at the offices of the publication Charlie Hebdo; and by Amedy Coulibaly in several shootings in Paris. They were armed with Kalashnikov pattern guns, however as nearly 200 different versions of the Kalashnikov have been produced around the world since the introduction of the AK-47, at the time of writing there isn’t enough information to start working out how they obtained the guns used in the attacks. 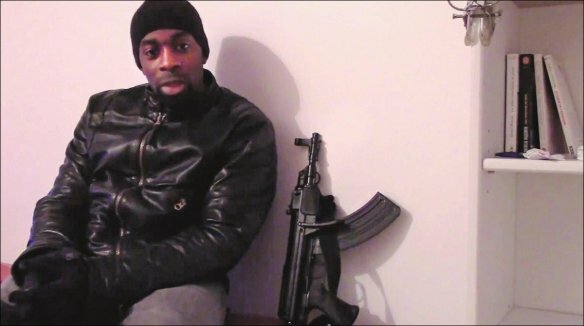 One of the killers, Amedy Coulibaly, posed next to a firearm in a video; and it has been identified as a Czech made VZ-58 Compact. Screenshot from video. This blog post is intended to clarify one misconception that has been present in the media and present some information on arms trafficking in Western Europe in order to show the most likely means by which they acquired their arms. I’ve been asked a few times about a news report entitled Paris Hebdo attack: France awash with black-market weaponry which mentions unnamed ‘expert s‘ who state that despite strong gun regulations in France “While the exact number is not known, estimates run to 10 to 20 million illegal weapons in circulation in France’s population of 65 million.” This estimate makes France seem like a war zone such as Libya and is highly misleading. The source for the 10-20 million estimate is not stated, but similar figures have been published in the Swiss based Small Arms Survey. However, that is an estimate of unregistered rather than illegal firearms. In France under current regulations some types of firearms, mostly simple shotguns (eg the have to be manually reloaded after every use) have to be registered upon purchase, something which will usually be done by the retailer. But owners do not have to declare all such weapons in their possession and in earlier years purchases were not required to be registered. Furthermore, the French police do not actively confiscate unregistered shotguns (unless they are used in criminal activity). There is therefore a large pool of firearms which are not registered but were nevertheless purchased lawfully. France has much stronger regulations in place for other types of firearms. For example semi-automatic rifles have to be declared by the owner and there are strict licensing requirements. Civilian ownership of fully automatic guns like the Kalashnikovs used in Paris is prohibited. There are other media reports quoting French Ministry of the Interior estimates of illicit possession in France of 4 000 military style automatic firearms like the Kalashnikov. However, that number dates back at least as far as 2010 and is evidently based upon the number of seizures per year and an assumption that military style automatic firearms make up 15 per cent of the total stock of illicit guns. The 4 000 military style weapons is much more plausible than 20 million illegal guns in France, but the 4000 figure is still about five years old and based upon a basic methodology. What we can say for certain is that homicide by firearm in France is very rare. In recent years the rate has fluctuated between 100 to 150 per year. In a country of 66 million people that means that in common with other Western European states France has one of the lowest firearm homicide rates in the world. However many illegal guns there are in France, they are very rarely used to kill people. The Kalashnikovs used in last week’s attacks were not manufactured in France. So where did they come from? We don’t know how he got that gun, and hopefully definitive information will be published in the future if the gun can be traced by law enforcement personnel. What we can say is that in Western Europe trafficking military style firearms almost occurs rarely and in very small quantities. A likely case would involve a few (certainly less than ten) firearms being smuggled in a car. The most often mentioned source are guns left over from the wars in the former-Yugoslav states, but small quantities are also stolen from police and military stocks (and other authorized holders) throughout Europe. Illicit firearms circulate between and within national borders – before it entered France Coulibaly’s gun may have been bought and sold many times. The most common type of firearms trafficker in Western Europe are people involved in organized crime. Guns are obtained by gangs involved in drug trafficking and other forms of armed criminality, such as bank robbery. There have been several reports from Belgian newspapers that Coulibaly had attempted to purchase a gun in Belgium. If so it is most likely that he attempted to use contacts with criminal arms traffickers who did not know the intended purpose for the gun – rather than use someone who specialized in supplying arms for political violence. (*) This paragraph was edited on 15 January 2015 to state that the gun seen with Coulibaly was likely a semi-automatic instead of a full automatic as previously written. Comments on regulations were also edited accordingly.